Despite the well-known efficacy of glucocorticoids (GCs), it is more common than exceptional that their known adverse event profile and co-morbidity implications elicit fierce debates when discussing their benefit–risk profile. These discussions usually come up, especially among GC ‘supporters’ and ‘opponents’,1 when trying to elaborate recommendations on how to use these drugs best in the treatment of rheumatic diseases such as rheumatoid arthritis (RA),2 polymyalgia rheumatica,3 giant cell arteritis,4 systemic lupus erythematodes,5 6 myositis7 and even systemic sclerosis.7 For example, very divergent opinions were learnt during work on the European League Against Rheumatism (EULAR) recommendations (2013 update) for the management of RA.2 As a result, only 73% (the lowest majority level of all recommendations) of the members approved the suggestion that GCs should only be used as bridging therapy for up to 6 months, ideally tapering them at earlier time points. Interestingly, when looking at the members voting against it, about half of them thought the statement was too weak, whereas the other half considered it to be too strong.2 Nevertheless, the level of agreement (strength of recommendation) was quite high (mean of 8.9) on final anonymous grading. It should also be noted that the group did not explicitly discuss the chronic use of GC in established RA. Indeed, many patients and quite some physicians are still uncertain about the actual benefit:risk ratio of GCs.1 This uncertainty might prevent optimal treatment under conditions where GC treatment is known to be of added value. Fortunately, our view on the most optimal use of these drugs does slowly but constantly maturate. This primarily results from thorough analyses of accumulated data in order to update recommendations, but there are also new and often qualitatively better data coming in to enrich our knowledge. A very good example of the latter is the work by Roubille et al.8 These authors report carefully collected 7-year data from a prospective multicentre observational cohort of patients with early arthritis (ESPOIR). Current gaps in knowledge were addressed by analysing the tolerability profile of GC use in early arthritis. As a result, a comprehensive data set now lies on the table to be judged by everyone. There are two key findings. First, the analysis of data of 602 patients with RA demonstrates patients with (versus without) GC treatment to be those with the greater use of non-steroidal anti-inflammatory drugs and disease modifying antirheumatic drugs, more active disease and higher C-reactive protein and anti-citrullinated protein antibody levels. These data confirm that there may be a significant bias in form of confounding by indication when analysing GC effects. Roubille and colleagues properly addressed this problem by performing a weighted Cox proportional-hazards analysis, with the use of propensity score and inverse probability-of-treatment weighting, and including age, gender, history of hypertension and GC treatment. When doing so, the real-life tolerability outcomes did not show any significant difference between RA patients with and without GC treatment. The facts that most of the patients who took GCs started this therapy during the first 6 months and that they received <5 mg prednisone per day clearly support the good safety profile of low-dose GCs for early active RA. Second, the mean dosage during the entire follow-up was only 3.1±2.9 mg/day which represents a very low-dose GC treatment.9 Therefore, it should be stressed that these safety data do not automatically lend support to higher doses. How can we achieve a positive benefit–risk profile when using glucocorticoids in the treatment of patients with rheumatoid arthritis? A matrix illustrating the benefit:risk ratio for a long-term therapy with GC. 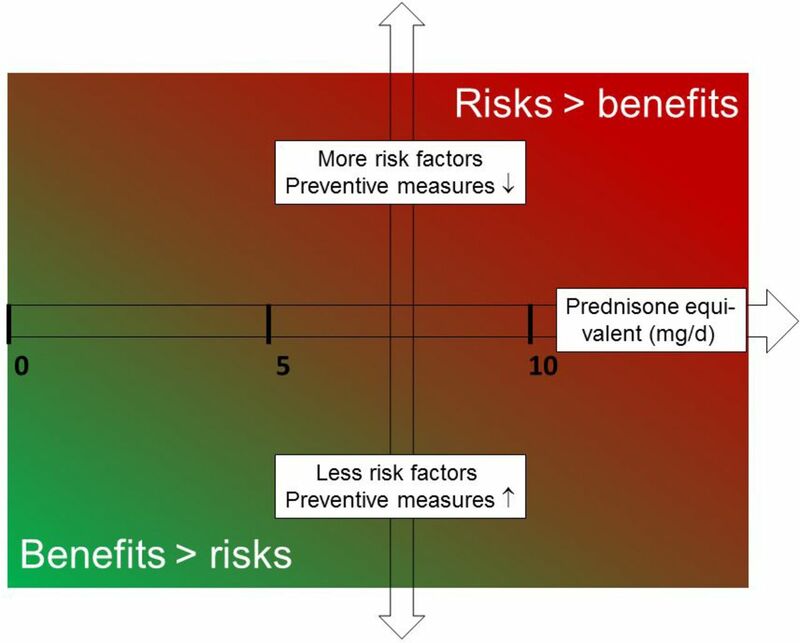 In general, lower GC doses together with the presence of less risk factors and more preventive measures lead to a lower level of harm, thereby leading to a better benefit:risk ratio of such a treatment (the green area). In contrast, higher GC doses together with the presence of more risk factors and less preventive measures lead to a higher level of harm, thereby leading to a worse benefit:risk ratio (the red area). More specifically, a therapy with dosages ≤5 mg prednisone equivalent for >6 months may have an acceptably low level of harm in the majority of patients (with exception of patients at high risk of CVD who may require preventive measures). At dosages between >5 and ≤10 mg/day, an acceptably low level of harm can only be assumed in the absence of certain risk factors and/or if appropriate preventive measures are taken. That is why the green colour gradually turns into red from bottom left to upper right. GC, glucocorticoids. It should be noted that the second part of this recommendation has been left unchanged stressing again that GCs should be gradually reduced and ultimately stopped, ideally within 3–6 months.10 The main reason for this is that the long-term use of GCs, especially at doses >5 mg/day, should be avoided because of the potential occurrence of adverse effects.1 In addition, the Task Force explicitly stated that the DMARD therapy may have to be considered a failure (and is, therefore, in need of optimisation) if GCs cannot be withdrawn within the time frame mentioned above. Recent data show that a large proportion of patients with early RA do stay on GC therapy for >6 months, indicating an acceptable balance between efficacy and safety. For example, the data reported by Roubille et al8 show that 64% of RA patients received low-dose prednisone for the entire follow-up. The mean duration of total GC treatment was 1057±876 days, which is much longer than the recommended maximum period of 6 months. Data recently published on the routine care of early RA point were in the same direction.13 More than 1300 patients were followed for up to 2 years in an early arthritis cohort (CAPEA), and complete 2-year data were available for 669 patients with RA. Seventy-seven per cent of those patients were initially treated with GC at different starting doses (26% <7.5 mg, 29% 7.5–20 mg and 45% ≥20 mg of prednisolone per day). Of note, after 24 months, 47% still were on GC. In conclusion, during treatment of both early and established RA, the risks of adverse effects induced by conventional GC can be minimised when following the established recommendations,15–17 and by considering each patient to be an individual person characterised by the presence or absence of certain risk factors and/or preventive measures. This will ultimately result in an adapted patient-specific therapy. Drawing updated conclusions based both on new data coming in and on balanced analyses of data already existing is a better way to go than relying on eminence-based statements (as has often been observed in the past and provided by both GC ‘supporters’ and ‘opponents’). Not picking single observations or speculating on limited (and/or sometimes biased) data sets in order to convey certain negative or positive judgements on these drugs, but rather full and continuous analyses of the whole picture are what is needed. Glucocorticoids are (still) just too important to make half-hearted, opinion-driven statements. Contributors Both authors have written together this article. Competing interests FB has received consultancy fees, honoraria and travel expenses from Horizon Pharma, Mundipharma Int. Ltd. and Roche, and grant support from Mundipharma Int. Ltd. and Horizon Pharma. JWJB has received consultancy fees from Horizon, Mundipharma, Enceladus and SUN.